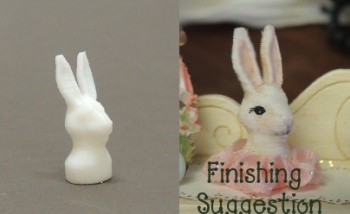 7/8 " tall 3D printed Rabbit head. Add a ribbon ruff, or glue on top of a box. Beautifully finished, high resolution 3D print from our new resin printer. Ready to paint using acrylic paints. Figure is white as shown on left, painted version on right is just a sample of how this piece could be finished.